Pugs love to tug on their leash. Pugs sneeze, snort and snore, but we love them just the same. Their flat noses may cause them breathing problems, but the trachea is a concern, too. A collar is not a good option for the pug. Protect his fragile trachea with a good-fitting harness. Pugs are social animals. They love people as much as they love their masters. This is great, if you don't mind your pug pulling on his leash to get to your neighbor walking down the road. Pugs are stubborn and determined, so they are difficult to teach how to walk with a leash. Because of their friendliness, willfulness and the strength of their broad shoulders, a pug can stretch a collar across its trachea easily by pulling on a leash. If he is walking with a harness, however, the pulling will not hurt the delicate trachea. 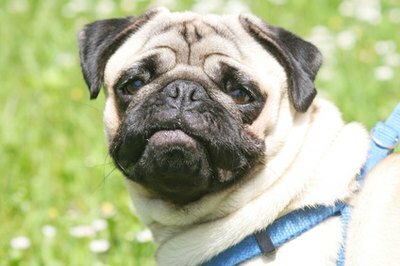 A common health issue in pugs is tracheal collapse. The trachea, or windpipe, allows passage of air from the back of the throat to the lungs. If the trachea collapses, the dog cannot breathe. Symptoms of a weak trachea include a honking cough, frequent coughing and exercise intolerance. Hot weather, exercise and excitement can induce coughing. Treatment includes steroids, weight loss, limiting excitement and the use of a harness instead of a collar. The pug has a rather unusually shaped body. The chest area is larger than what you would expect for a small dog. Measure around his chest before purchasing a harness and look for a harness that has adjustments. An adult pug will probably need a large-sized harness because of his broad chest. Some harnesses are made with a soft mesh to eliminate chafing. Since the pug has sensitive skin, a harness with a mesh panel will protect the skin from irritation. If you want to stop your pug from pulling or tugging on his leash, you may want to consider a harness that has clips in the front instead of the back. If the harness clips are on the back, it actually gives your dog more ability to tug and pull on the attached leash. A front-attaching harness redirects the dog back to you. If he tries to pull ahead of you, the harness will turn him around so he is facing you. Dr. Sophia Yin, DVM, MS: Which Type of Collars are Harnesses are Safe for Your Dog? Does Putting a Kitten in a Carrier Calm It Down?